A Vancouver Canucks fan prepares to smash a window at a Blenz Coffee shop during a riot in downtown Vancouver on Wednesday, June 15, 2011. A downtown Vancouver coffee shop that was severely impacted during the Stanley Cup riot finally reopened Friday, as the company waits for progress in its lawsuit against looters. The line stretched out the door and into the street as customers waited to get their free cups of coffee at the Blenz shop at 495 West Georgia St. when it opened at noon. The café suffered more than $100,000 in damage during the chaos of June 15, but the company's president George Moen says the trauma suffered by employees has caused more lasting damage. 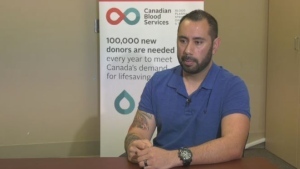 "We have insurance that can replace the stuff, but it was the people impact that was the worst for me," he told CTV News. The coffee chain filed a civil lawsuit in June asking for damages for two staff members and a customer who were trapped inside by the riot and hid for hours, terrified, in a back room as looters smashed equipment and made off with furniture. "This isn't a videogame that you can turn off and go home. There was real consequences to these actions," Moen said. He says a few of the people believed to be responsible for the ordeal have been identified, and Blenz is now waiting for charges to be laid before the suit can go forward. The suit names 150 John and Jane Does. But unlike many who have criticized the Vancouver police and Crown prosecutors for not laying a single charge in the two months since the riot, Moen says he's happy to wait as investigators gather evidence. "One of the things I love about Canada is that we have a justice system that takes its time to make sure it gets it right," he said. "I understand there's frustration out there, but let's get it right." That's not an opinion shared by next-door neighbour Francesco Caligiuri, whose Ristorante Da Gino was also damaged during the riot. "By now, we should have had some people charged and convicted," he said. "They should have had something and made some examples." Criminal lawyers say that one of the delays in securing charges could be the requirement that the photographers responsible for thousands of images and videos of the riot agree to testify in court. But Caligiuri says he's reluctant to testify about the surveillance video he's submitted to investigators. "I shouldn't have to go to court. There's my video -- I'm already submitting it," he said. "I want to start putting this behind me. I don't want to -- in about six months or a year from now -- go to court and be like, ‘Yeah, he's the one who broke my window." Vancouver Police Const. Jana McGuinness defended the lack of charges in a press conference Friday. "Our goal with this investigation is to put all of the charges against one individual forward at the same time, and we can do that by a close examination of all of the available evidence," she said. "We want to ensure the most severe charges go forward to court, and that a person who commits a minor charge or a theft isn't getting off on maybe an arson or an assault." The Vancouver Police Department has spent much of the past week fending off comparisons to the response to the riots in London, where 1,000 suspects have already been charged since violence broke out two weeks ago. Blenz Coffee is suing the rioters who smashed in windows at three downtown stores following the Game 7 Stanley Cup playoff game on June 15, 2011.